1Serrated extracting end of tool bites into damaged screw head. 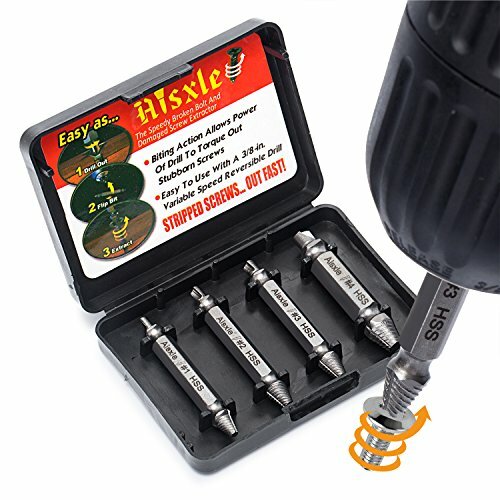 You can now easily remove the most stubborn hard to remove screws. Great for stripped, broken, stuck or damaged and screw removal. Made from hardened tool steel and tempered twice for extra hardness and a lifetime of use. The 2 in 1 drill bit and extractor in one tool extracts fasteners fast; Compatible with quick chuck systems or chuck directly into drill. Note: these bits are not for commercial screw removal. All Aisxle items are backed by a Limited Lifetime warranty. Please contact us via email if you have any questions. View More In Industrial Drill Bits. If you have any questions about this product by Aisxle, contact us by completing and submitting the form below. If you are looking for a specif part number, please include it with your message.